Note: Noodle lived a long, happy, and healthy life as a therapy dog, and died peacefully at age 12 1/2 in April, 2013. Noodle was born 10/25/2000. 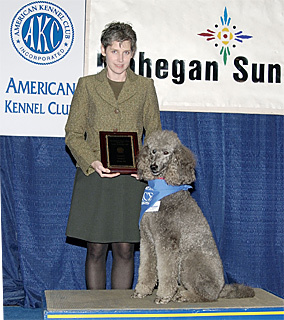 New York, NY - The American Kennel Club (AKC) announced the winners of the sixth Awards for Canine Excellence (ACE). The award is designed to commemorate loyal, hard-working dogs that have made significant contributions to their community. Awards are given annually to dogs in each of the following five categories: Law Enforcement, Search and Rescue, Therapy, Service and Exemplary Companion Dog. "Each year, we are astounded by the extraordinary stories of heroism, loyalty and companionship of our ACE Award nominees," said Ron Rella, AKC Director of Project Administration and member of the judging panel. "The ACE Awards are truly special, because not only are we able to honor canines that have valiantly served the community, but we are able to show the world what dogs can really accomplish. We are proud to honor these worthy canines and their owners with the 2005 ACE Award." This year's five recipients will be honored individually at local ceremonies. Collectively, they will each receive a cash award of $1,000 and an engraved sterling-silver collar medallion at the AKC/Eukanuba National Championship in Tampa, Fla. The annual dog show will be televised live on Animal Planet on January 15 - 16, 2006. Noodle is a 4-year-old Poodle certified by Therapy Dog International and Therapy Dogs, Inc. She works at the Northwest Village School, a special education school where her owner, Stacia Bjarnason, is a psychologist. At the school, Noodle helps mentally and physically challenged children by spending hours of quality time with them each week. Noodle comforts and listens to students talk about their problems or just sits for a quiet pet. Nominated for the ACE Award by the students and faculty she assists, one staff member said of the dog, "Noodle is such an asset to our school setting. I have seen Noodle change the mood of a very depressed student." 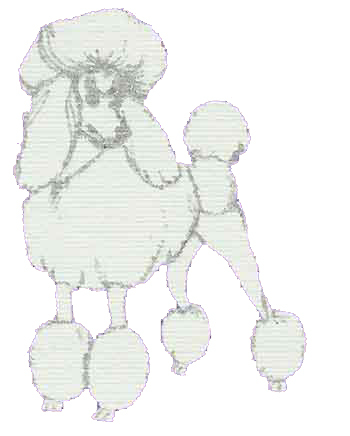 Another student has a "Noodle the Poodle" sheet on her desk, where she wins points towards an individual session with Noodle. The incentive helps her to focus during class. Noodle's time spent helping children is not over once she leaves the school. Noodle and her owner spend time listening to children read at the library, demonstrating therapy skills at local elementary schools and visiting children at Safe Home, an organization that fosters children.